The write-off in the last six months comes at a time when banks are struggling to resolve many cases of repayment of loans and recover money stuck with corporate defaulters through insolvency proceedings. INDIA’S STATE-OWNED banks have written off loans worth Rs 55,356 crore in the first six months of fiscal 2017-18, according to data compiled by credit rating agency ICRA, as banks attempt to clean up their balance sheets after a string of defaults by firms and promoters in the wake of the economic slowdown. The write-off in the last six months — 54 per cent higher than the Rs 35,985 crore written off in the same period last year — comes at a time when banks are struggling to resolve many cases of repayment of loans and recover money stuck with corporate defaulters through insolvency proceedings. 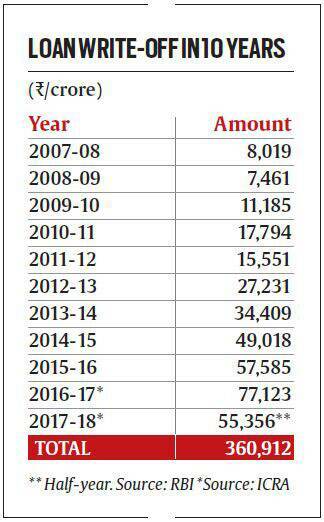 Figures obtained by The Indian Express from the RBI through the Right to Information (RTI) Act for the last decade show that banks had written off Rs 2,28,253 crore in nine years — from fiscal 2007-08 to 2015-16. The central bank did not provide data for the subsequent period. Separately, responding to a questionnaire from The Indian Express, ICRA said that write-offs amounted to Rs 1,32,659 crore in 2016-17 and the first six months of 2017-18. This means the the total write-off in the last ten years is now over Rs 3,60,000 crore. The RBI had earlier explained that writing off of non-performing assets or bad loans is a regular exercise carried out by banks to clean up their balance sheets. “A substantial portion of this write-off is, however, technical in nature. It is primarily intended at cleansing the balance sheet and achieving taxation efficiency. In ‘Technically Written Off’ accounts, loans are written off from the books at the Head Office, without foregoing the right to recovery. Further, write-offs are generally carried out against accumulated provisions made for such loans. Once recovered, the provisions made for those loans flow back into the profit and loss account of banks,” the RBI had said in an explanatory note. The write-offs, even if “technical”, is significant in the context of ongoing efforts by the government to enable a clean-up of balance sheets of banks. Repairing that and enabling banks to lend again by infusing fresh capital is at the heart of some of the recent measures unveiled by the government. Banks will initially make provisions on such assets and then a write-off is done when the loan becomes irrecoverable. The loan is then excluded from the balance sheet and taxable income of banks gets reduced. Banks were engaged in a massive write-off of loans over the years and the figure hit a high of Rs 77,123 crore during the year ended March 2017, against Rs 57,585 crore in fiscal 2015-16. Ten years ago, in 2007-08, loans written off by banks were just Rs 8,019 crore, the RBI said in its reply to an RTI query. However, experts say there is a perception that write-offs are not transparent and public funds are being misused. “You can’t clean up every quarter or every year. Once in five or ten years, we are cleaning up the balance sheet for the last 20 years. You can’t clean up every year. Generally write-off should be small, and should be used sparingly when there’s some crisis. Technical write-off creates non-transparency, destroys the credit risk management system and brings all types of wrongdoings into the system,” said a former RBI official. “I have nothing against a write-off but it has to be done scarcely and within a policy, with all efforts taken to recover the money. Any asset which is backed up by tangible asset is never written off. Secondly, you must be subject to scrutiny for these write-offs. There must be a policy. You ask any bankers. They have written off Vijay Mallya’s loan. Then how are they going to recover that money? Use it very sparingly and do it where it’s essential. If there’s asset, why are you writing it off?” the official said. Accordingly, the provision cover ratio, including technical write-offs, improved to 60.5 per cent as on September 30, 2017, the highest since the launch of the asset quality review by the RBI during Q3 of FY2016, Srinivasan said. According to ICRA, provisions made by banks on advances surged by 30 per cent to Rs 64,500 crore during the second quarter ended September 2017, with more corporates coming under the insolvency process. For the first half of the fiscal, the total credit provisions were up by 17 per cent on a year-on-year basis at Rs 1,10,000 crore. With the total exposure of Rs 3,00,000 crore of accounts likely to be resolved under the new bankruptcy code, the overall credit provisions are likely to be at Rs 2,40,000-Rs 2,60,000 crore, including impact of ageing on existing NPAs and provisioning on IBC accounts, for FY2018 as against Rs 2,00,000 crore during FY2017. The asset quality pain is likely to continue in the near term with Rs 1,70,000 crore of standard restructured advances. Gross non-performing assets (GNPA) are likely to peak at Rs 8,80,000-Rs 9,00,000 crore (10.0-10.2 per cent) by the end of FY2018 as against NPAs of 9.5 per cent (Rs 765,000 crore) as on March 31, 2017, Srinivasan said.